With the F-111 establishing U.S. supremacy in the design of attack aircraft in the early 1960s, the task for Soviet engineers was clear – create a plane that could combine the tasks of a fighter-bomber and a fighter-interceptor to achieve accuracy, speed and manoeuvrability at both high and low altitudes. In the early 1960s, Soviet aviation engineers received one of their hardest tasks yet: As the United States pulled ahead in attack aircraft design with the powerful “sweep-wing” F-111, the Soviet Air Force needed a plane that fused two proven existing designs, the Su-7B fighter-bomber and the Su-15 fighter-interceptor. The aircraft had to be capable of hitting small ground targets, reaching supersonic speeds and breaking through low-altitude enemy air defenses at 50 meters – and make it home. The Su-15 was taken as the basis for the new design in 1963 and quickly underwent major changes. The Orion radar system installed in the nose cone was large enough to seat its two-man crew in a ‘tandem’ arrangement, side by side. It was initially planned to install four RD36-35 engines to ensure short take-off and landing capacity, but three months after the maiden flight in August 1965, the aircraft received two AL-21F engines instead. These, some experts claim, were designed using a J79 engine taken from a U.S. fighter shot down in Vietnam. By this time, Soviet designers were lagging significantly behind their American counterparts who had put the state-of-the-art F-111 aircraft into the skies eight months earlier. The U.S. aircraft had a variable-sweep wing ("swing wing"), which could be adjusted backward for supersonic flight and then returned to its original wide-angled position for slow speeds. This allowed the plane to combine high-altitude supersonic flight and stable low-altitude flight while carrying a heavy bomb load. 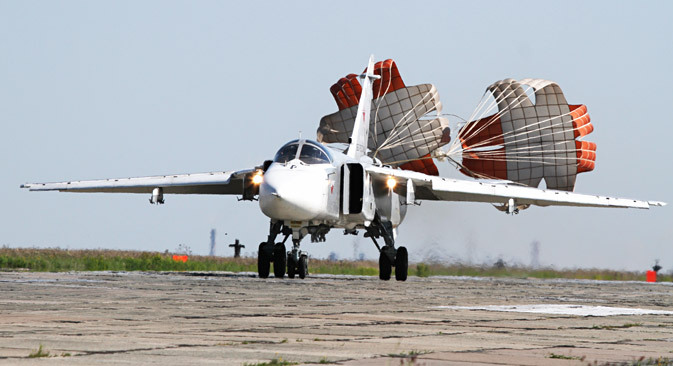 The Soviet sweep-wing made its maiden flight in January 1970, when it was officially designated the Su-24, although five more years elapsed before it went into service. The delay in operational development and adoption was due to the number of accidents during testing, especially in the early stages, caused largely by the number of features not previously used in Soviet aviation. The lives of test and operational pilots were saved on numerous occasions by the K-36D ejector seat, although even these created some headaches in their installation. In one incident in November 1975, a crewman sitting in the right-hand seat prior to a test flight unwittingly snagged its activation pin, and moments later the unsuspecting navigator was catapulted from the cockpit. According to records of the incident, his chute opened normally and he floated down safely in the first ever ejection from a stationary Soviet aircraft. The Su-24 can be flown automatically or semi-automatically and hug terrain at an altitude of just 50 meters. It incorporated the Soviet Union’s first integrated digital navigation and attack system, which had a laser rangefinder and TV system, expanding the range of potential targets and also the altitude from which attacks could be launched. Despite the variety of its weaponry, including guided missiles and an unprecedented heavy payload, the main armament of the aircraft, like many of its predecessors, was a tactical nuclear bomb. According to the U.S. Department of Defense, the Soviet arsenal of the devices at the time was several times larger than NATO’s, and the emergence of such a refined delivery aircraft further aggravated the existing imbalance in the European theater of operations. Meanwhile, the U.S. F-111 actively fought in Vietnam after a dismal debut in the conflict, when the aircraft was repeatedly downed by old S-75 anti-aircraft missiles, despite its supposed immunity to ground fire. By the end of the conflict, however, the F-111 was regarded as the most effective of all U.S. military aircraft used there. The Su-24 saw its share of combat in Afghanistan, the two Chechnya conflicts, and most recently in South Ossetia in 2008. But in all cases it was operating in adverse conditions, with reduced effectiveness against small enemy forces moving in mountains and villages, rather than large concentrations of enemy (NATO) targets on flat terrain as originally anticipated. Unconfirmed reports say two of the aircraft were lost in South Ossetia. More than 1,400 of the aircraft were produced in all modifications. Today, the Russian Air Force operates 124 upgraded Su-24s, but these are being replaced by the Su-34 and are due for complete withdrawal from service in 2020.